I have a 4 year old daughter and she was my reason for getting back into sewing 5 years ago during my pregnancy click to investigate. So its fair to say that I have made a lot of clothes for her during that time, in particular I love to make her party dresses and she adores wearing them. 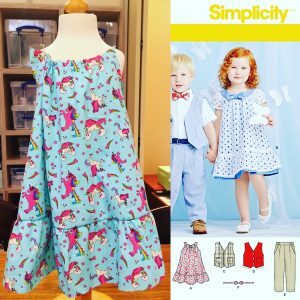 When I heard about the Simplicity Sewing Challenge, I thought it seemed fun and would give it a go. I didn’t realise that this very simple looking dress is actually far more challenging for me than I initially thought it would be. I am not great at gathering and I had never done a gathered yoke and sleeves in this way. I decided to make a working toile and Little One picked out the fabric in one of my favourite fabric shops Fabric Land at the Brighton Branch. The actual fabric I am going to use for the challenge is a beautiful cream, peach and mocha coloured, hand stitched ribbon on mesh over a light coffee satin underdress. However having made the toile, the fabric is going to make it even more challenging, but then I do love a challenge!